It wasn't until I gave in to the Biblical Doctrines of Grace that I finally believed that God was mightier to save than I was to muck it all up. How gracious of Him to save us, even while we go on believing that lie. He is mighty to save indeed. Charles Spurgeon is my homie! This is a perfect segue for Stuart Wood . . . oh Stuuuart, Stuuart . . . ;-). If Christ died only for the "elect," I wonder what humanity he assumed in the incarnation. Since humanity is universally permeated by sin, and Jesus assumed humanity; wouldn't it follow that all of humanity was taken to the cross? If not, we would have to posit a hybrid humanity ---viz. "elect humanity" --- who was sanctified prior to the incarnation and the cross; thus nullifying the necessity for the cross at all. This is the necessary implication of particular or limited atonement. If we are going to hold to a genuine substitutionary atonement, then Christ needs be "fully human" (besides of course being fully God); which means that: He who knew no sin, became sin for us, that we might became the righteousness of God in Him. In other words: The unassumed, is the unhealed. ~Gregory of Nazianzus. The breakdown with the anecdote provided by Spurgeon is that the "judge" is just as guilty as the criminal; and the substitution offered in the story only meets certain juridical/external/behaviorial problems. It does not truly expiate for the sins of the murderer; the problem is much deeper than that. The sins of the murderer could only truly be paid for if the life of the slain could be brought back to life; since this could not be done, only the juridical penalty could be paid for --- this is only a half-baked answer of justice. The cool thing is that Jesus did all of it. He paid for the judges' sins; he paid for the slain's sins; he paid for the murderer's sins; and he paid for our sins. He did this, certainly by meeting the penalty (juridical); but also by becoming us, from the inside/out. He has provided for ALL to have life, in Him. This way, none of His blood was spilled in vain --- even for those who will fail to subjectify His life as their own (which it is objectively). Their condemnation, falls out of the reprobation that Christ became for them on the cross. Their refusal to respond to "life," is the basis for their condemnation, and thus experiencing of "Gospel Wrath." If Christ is not the center of election/reprobation (atonement) discussion; then we are. And this certainly cannot be the result of a "Christ-centered" theology. "Faith," said the man, clapping his hands, "that's the gospel, if it isn't, then I don't know anything, for no man could have made that up, it is so wonderful. It wouldn't surprise me if this is something Phil read aloud during the recent conference on "The Glory of the Atonement," even though the quote explicitly associates a strictly limited atonement view with "the gospel." There are problems with other things said in the quote, but that's the major problem, and there is no escaping that fact. As Phil and co. have chosen the path of censorship rather than allowing their theological opinions to be tested against the light of God's Word, there is very little I can say without being "banned for life" from this blog. 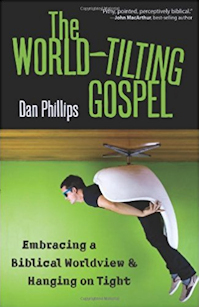 The fact that Mr. Phillips could not and would not answer the most basic question that every true minister of the Gospel ought to be able to answer is not only appalling but also should send up a red flag to anyone who has eyes to see. How can one claim to be a minister of the Gospel and not be able to tell another poor and miserable sinner that Christ died for his sins personally? And yet I am slandered, maligned, and censored for asking such a "trick" question? Anyway, as to this posting by Phil, you will readily recognize that there is not even one Scripture passage quoted here, not one. All is the vain reasonings of man. As Luther said, "Though devils all the world should fill, all eager to devour us; we tremble not, we fear no ill, they shall not overpower us. This world's prince may still scowl fierce as he will; he can harm us none; he's judged - fore'er undone, one little word can fell him." That word, dear Bobby, is the word "our" in Paul's own clear defintion of the one and only saving Gospel in 1 Cor. 15:3, how that, "Christ died for OUR sins", yes, yours, dear Bobby, and mine. This alone is God's own dear Gospel which He alone sealed with His own blood. Woe to the man who would dare to change a single word of it. Thanks for sharing that. I know you are the "demon" here (and I probably am considered a cohort from a different angle); that's why sarcastically called you out. But I would suggest that you would be "on topic" if you were to speak on the issue that you are so passionate about. This seems to be a chance for you. I'm afraid that many Classic Calvinists (I consider myself an "Evangelical Calvinist," I have a blog for explaining that)have absolutized the form, as another friend has coined it; in other words Dordt and Westminster has become the "standard of Orthodoxy," w/o question . . . even is scripture questions it. I could go on and outline the history of ideas that has led to the MacArthurite situation; but again, I have a blog for doing such things (albeit my blog is not myopically focused upon the hybrid version of Calvinism that one finds with those in the MacARthur camp --- I hope to present a positive version of Calvinism that is both "Evangelical" and "historical"). Although let me add, I still believe the Pyromaniacs are "brothers;" do you? I don't believe that they are any less brothers, than Paul thought Peter was in Galatians. Wonderful bit of Spurgeon, Phil. Thank you. Have a good trip back to the states, btw. A simple, direct, plain explanation of the Gospel. I still HATE the "gospel" explanation Spurgeon gave here. Sometimes those of us who love the Gospel are so eager to see it vindicated that we will be pleased with the sort of scheme presented here, even though we would be appalled at it in any other setting. If your loved one was murdered, and the identity of the murderer were known, and the government came to you and said, "Good news! An innocent party came and offered to be executed in place of your loved one's killer, and we agreed! So now the innocent party is dead, the killer is back loose on the streets, and isn't that great?" Would you agree that justice was done? Wouldn't you be horrified? Imagine if that official looked at you in confusion and said, "Well, we had to kill SOMEBODY for the crime, and we did! How could you not be satisfied with that?" Stay with me here, because I fervently believe in the substitutionary atonement. 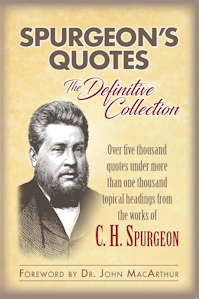 But the explanation Spurgeon gave was not adequate, as an honest look at the hypothetical situation above would show. 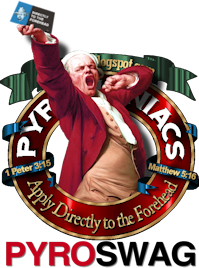 What Spurgeon described was a gross miscarriage of justice. The substitutionary atonement which happened at Calvary was absolutely just. So something more happened at Calvary than what Spurgeon described there. What happened at Calvary was this: An innocent party, completely identified with the murderer, stepped up to take the murderer's punishment and die in his place. BUT THAT'S NOT ALL! He also gave a "heart transplant" (if you will) to the murderer! The murderer's own heart was to be taken out (in essence, "killing" him), and the innocent man's heart was given to him, changing him forever. When he was turned loose, no one could rightly say that a murderer was out on the streets. Instead, a new life, with a new nature, was turned loose on the streets. (It's better than just killing the murderer, if you get a better man added to the scene in his place!) AND the innocent party who died was raised again from the dead, and now enjoys the well-deserved love and adoration of all those whom He has redeemed in this fashion. Of course Spurgeon knew the true Gospel. Why he presented this illustration is beyond me, but I know it's been used by many people over the years, and every time I hear it, it makes me queasy. If just one person re-thinks this whole thing and decides not to present this distorted view of the Gospel again, it will be worth whatever ire I may bring on myself here. My question to you is who was Paul's letter addressed to? You're right. That has been pointed out to him. 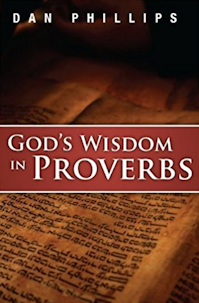 As with every Scripture that clashes with Wood's human-tradition position, he shrugs it off.